656-TL-ANThis task table lamp has an antique nicke..
656-TL-SCThis task table lamp has a satin chrome f..
2017CUMacbeth Industrial Adjustable Table Lamp, An..
1039GYNanna Table Lamp, Ash Wood, Matt GreyThis ar..
1039BKNanna Table Lamp, Ash Wood, Matt BlackThis c..
652-TLANA task table lamp with an antique brass ef..
652-TLSCA task table lamp with a satin chrome fini..
1853GYScandi 1 Light Table Lamp, Matt Grey, Chrome..
5961BGDiablo Led Table Lamp, Matt Black and GoldDi..
5961BWDiablo Led Table Lamp, Matt Black, Chrome & ..
1811CLTouch Lamps - Touch Table Lamp, Chrome, Clea..
1811SMTouch Lamps - Touch Table Lamp, Chrome, Smok..
9961ABTouch Table Lamp Antique Brass - White Glass..
9961SSTouch Table Lamp Satin Silver - White GlassE..
MUNI-TLCHAn LED table lamp with a polished chrome ..
MUNI-TLCOAn LED table lamp with a polished copper .. The desk / task lamps purpose is to sit comfortably on your desk, providing you with a comfortable amount of lighting either providing spot lighting for the surface or a wider range of brightness for the full desk or table it's sat on; on top of adding a touch of interior design to your desk or table. 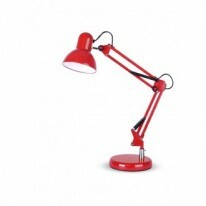 We have the perfect range of task lamps for you to choose from at Lumination. Our Task lamps come from the best manufacturers so you know you are getting the best. If you need help in choosing which one is the best solution for your needs please contact us via phone, email or contact form.